September is National Honey Month and we are celebrating this ancient super food this week with a recipe for Honey and Vinegar Candy! It’s a healthy and simple, bite-sized candy packed with all of the nutrients that come from the sweet, gooey goodness of honey. Honey is one of the oldest and healthiest foods on earth. Evidence of man’s interaction with bees and honey has been found in ancient rock art from Africa and Spain. 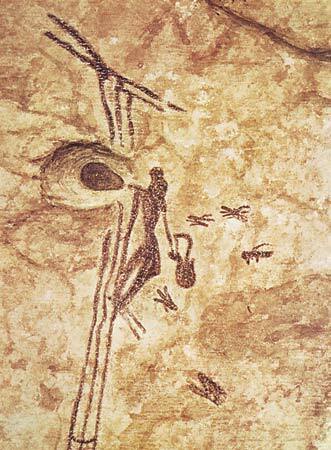 Perhaps the oldest and most well-known example of beekeeping/hunting comes to us from a 15,000 year old Paleolithic cave painting in Valencia, Spain. Called the “Man of Bicorp,” it was discovered in 1921 in the Cueva de la Arana and depicts a person hanging on ladders picking honeycombs while bees buzz around a nearby beehive. 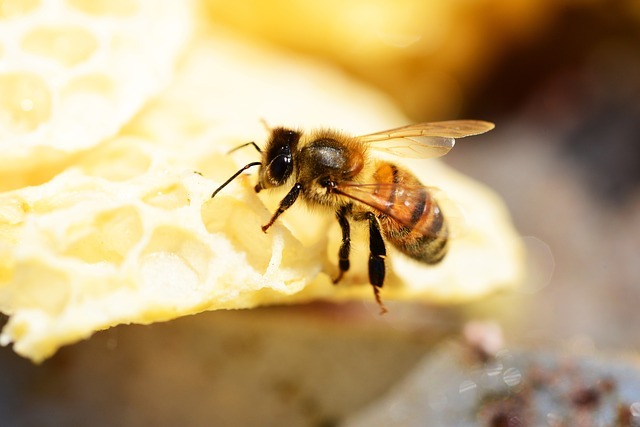 Bees and honey are mentioned in many of humanity’s oldest writings, including cuneiform writings from Sumer and Babylon, the Indian Vedas, the Hittite code, ancient Chinese writings and Egyptian hieroglyphics. In fact, the Egyptians even had a “Sealer of the Honey” as early as the first dynasty. This person would have been in charge of carrying the seal for the rooms where the honey was stored. The Egyptians truly treasured the sticky gold and used it as food, medicine and even an offering to the gods. The Greek physician Herophilus who founded the medical school at Alexandria identified a salve made from honey as one of the top three “non-magical” Egyptian “methods of wound care.” Pharaohs also used honey to celebrate weddings and they passed this tradition on to the Romans, who were also great lovers of honey. Both cultures believed the sweetener would provide good luck and happiness to the newlyweds. This is where the word “honeymoon” has its origin. The idea of the sacredness of the bees, the considerable role which honey plays in the mythology, is not Indian, or Indo-Iranian, but according to the showing of the Greek beliefs, is really prehistoric; its occasional intrusion in the Vedas must rest on ancient tradition. But why was honey so prized? Does it deserve its almost magical reputation? Perhaps. Consider that sealed jars of honey, many thousands of years old, have been found inside of Egyptian tombs completely preserved. One can open the jar and actually eat the honey that has existed inside for millennia as if the jar were simply plucked from the grocery store shelf. This is because honey does have something of the “magical” in its makeup. Several factors combine to create a food that is delicious, nutritious and seemingly eternal. First, it is hygroscopic, meaning it is extremely low in moisture content but can easily absorb moisture if it is not sealed. This makes it very difficult for bacteria and microorganisms to survive and pollute the honey. Second, it is highly acidic, another hindrance to the potential bacterial invaders. Finally, the bees are integral to honey’s curative powers by providing the ingredient that sets honey apart from other foods with similar properties. The bees contribute an enzyme called glucose oxidase that when combined with nectar breaks down into gluconic acid and hydrogen peroxide. The hydrogen peroxide in honey is a known anti-bacterial agent. Honey just may be the perfect food and we’ve known about it since prehistoric times. The smoke from our first fires helped us to ward off the bees long enough to collect the syrupy perfection. Once we discovered honey’s benefits, we quickly immortalized it in our medicines, literature and mythology. So this month make an effort to enjoy honey and all of its magical, medicinal properties. Drizzle it over some fruit, spread it on your toast or visit honey.com for more adventurous recipes. And mix up a batch of Honey and Vinegar Candy to delight your taste buds all month long! Pour the honey and vinegar into a heavy saucepan. Place pan over medium heat until mixture starts to boil. Remove from heat, add vanilla, if desired. Immediately pour onto a parchment lined baking sheet. Place in freezer or refrigerator to cool. 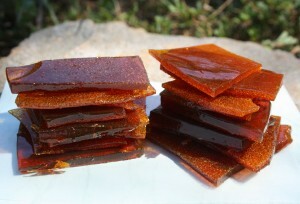 Once completely chilled, break into long strips, then break those again into smaller, bite-sized pieces. Crane, E. (1999). The world history of beekeeping and honey hunting. New York: Routledge. Selin, H. (2008). Encyclopaedia of the history of science, technology, and medicine in Non-Western cultures (2.nd ed.). Berlin: Springer Science and Business Media. Ransome, H. (1937). The sacred bee in ancient times and folklore. Boston and New York: Houghton Mifflin. Hillebrandt, A. (1891). Vedische Mythologie. Breslau: Koebner [u.a.]. Geiling, N. (2013, April 22). The Science Behind Honey’s Eternal Shelf Life. Retrieved September 1, 2014. This entry was posted in Blog, Bon Appetit Wednesday and tagged ancient cave paintings, Ancient Egypt, ancient history, ancient medicine, ancient preserved honey, ancient recipes, AntiquityNOW, Bon Appetit Wednesday, Herophilus, honey, honeymoon, Man of Bicorp. Bookmark the permalink.